"King of Schlock" is not a title most directors would embrace. But William Castle was not like his peers. More a showman than a true visionary, Castle's body of work doesn't include many groundbreaking classics or sequences that could be considered truly terrifying. And yet his films enjoyed great financial success. Why? Because he gave audiences exactly what they wanted: gimmick-laden terror rides. Indeed, he was the P.T. Barnum of the genre. Born William Schloss in New York City in 1914, he changed his last name to Castle when he decided to go into acting. He notched a few years as a dialogue coach for Columbia Pictures before making his directorial debut in 1944 with The Whistler, the first in a series of detective films. By the 1950s, he was helming westerns, gangster pictures and dramas for the same studio...all of them 'B' projects. And so Castle decided that if he was going to make his mark in the business, he would have to start his own production company. Henri-Georges Clouzot's Diabolique was released in the United States in 1955 and was a huge influence on other directors, including Castle. He produced and directed 1958's Macabre, based on the novel "The Marble Forest" by Theo Durant. The story concerned a young girl who is kidnapped and buried alive in a cemetery, while the suspect responsible demands that his ransom be met. Like Diabolique, the film ends with a surprise twist. Castle was not impressed with the final result and added his own special promotion: he would insure each member of the audience for $1,000 should they die by fright from watching Macabre. It worked and the film was a hit. This success led to others, including two 1959 features, House on Haunted Hill and The Tingler (both starring Vincent Price) - and 13 Ghosts (1960). Castle's pictures made a fortune and the "haunted house" theme seemed to be his forte. No doubt Alfred Hitchcock's PSYCHO was another turning point for Castle, who made Homicidal (1961) shortly after. It too involved the always reliable "killer transvestite" theme and (in some quarters) was actually better received than Hitchcock's work. In addition, Castle started to copy The Master's habit of slyly appearing in his own films. Castle worked non-stop throughout the sixties. Among his movies in that period were Mr. Sardonicus (1961), as well as a remake of The Old Dark House. He contributed several entries to the "Ladies of the Grand Guinol" subgenre. Joan Crawford was excellent as a supposedly reformed ax-murderess in 1964's Strait-Jacket and commanding (if somewhat over-the-top) with a smaller role in I Saw What You Did (1965). The premise of the latter made it a delightful addition to the "babysitter-in-jeopardy" tradition: two young girls in charge of watching a kid sister for the evening...decide to relieve their boredom by picking phone numbers at random and uttering the title phrase. Unfortunately, one of the recipients of this "joke" has just committed a violent murder - and soon comes after the terrified teens. That same year, Castle directed the legendary Barbara Stanwyck in The Night Walker, reuniting her with former husband and co-star Robert Taylor in a script by Robert Bloch. House on Haunted Hill: "Emergo!" - a skeleton shook above the audience, mirroring what happens in the movie. The Tingler: "Percepto!" - buzzers were placed under the seats to provide shocks during certain moments. 13 Ghosts: "Illusion-O!" - viewers were given the opportunity to see spirits on the screen with special glasses. Homicidal: "Fright Break" - a brief pause in the film allowed audiences to leave the theatre before the conclusion. Mr. Sardonicus: "Punishment Poll" - moviegoers could vote on the fate of the villain at the climax. Castle's one true masterpiece is a film that he did not direct himself. Having bought the rights to Ira Levin's novel Rosemary's Baby, Paramount insisted that it be helmed by someone other than Castle. Roman Polanski was chosen, Castle produced the project...and a true horror classic was born. After that, he directed very little: Project X in 1969 and Shanks in 1975. In between, he was the executive producer for the short-lived series Ghost Story, which ran during the 1972-73 television season. In addition, he produced Bug, a crazy little film about incendiary cockroaches. It was not a huge hit at the box office but has its own fun and twisted moments. 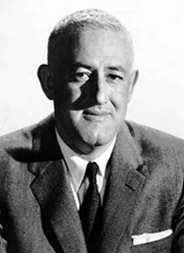 William Castle published his autobiography entitled Step Right Up! I'm Gonna Scare the Pants Off America in 1976. It showed that while clearly a professional businessman at heart, he displayed an avid affection and joy for the horror genre. He died in 1977 of a heart attack.